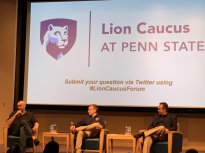 On Monday evening the Penn State College Republicans and Penn State College Democrats kicked off PSU Votes Week with a testy debate about constitutional interpretation. PSU Votes Week is designed to promote political engagement by Penn State students through a series of public events and offering students convenient options to register to vote. 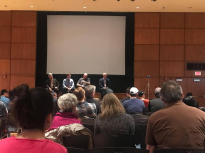 Jake Griggs, the chair of the UPUA governmental affairs committee, moderated the discussion between Allison Dombach, Aidan Mattis and Chile Menuga for the Republicans and Kelsey Denny, Jacob Klipstein and Lexy Pathickal for the Democrats. With three debaters on each side and in-depth questions, College Democrats president Katierose Epstein said the organizations were emphasizing substance in their arguments. The College Republicans argued for originalism, the view that the Constitution should be interpreted in the context in which it was written. The College Democrats argued the Constitution is a living document, subject to changing interpretation to fit modern times. The debaters went back and forth on constitutional restraints on the government, the role of the public in the judiciary, due process and several Supreme Court cases, particularly DC v. Heller and Obergefell v. Hodges. After the event, College Republicans president Reagan McCarthy said she was happy with the turnout at the Flex Theater, which was over capacity with standing room only. Despite a night of contentious conversation, McCarthy and Epstein still agree to disagree on how Americans should read America’s governing document. On Thursday, the UPUA will host a voter registration event on the HUB lawn from 11 a.m. to 3 p.m. and the Graduate and Professional Student Association will host a panel on gerrymandering in 129B HUB at 6 p.m.